Project Managers are among the most positive of people. Armed with our methods and tools, our boundless optimism and our can-do attitude, it sometimes feels like we can do anything. Yet the fact is, there are limitations. We must all face some uncomfortable truths. This is a personal perspective, so it may reflect my own insecurities, rather than yours. But I suspect many of them will resonate with you, as they do with audiences to whom I speak, across the United Kingdom. This has led me to conclude that of all the project management processes and disciplines, stakeholder engagement is paramount. Famously, software engineer and author Tim Lister said that: “Risk management is how adults manage projects.” In response, I’d add that: Stakeholder engagement is how sophisticated adults manage projects. The only way to regain control of your outcomes from your stakeholders is to invest your time in them. Understand their perspectives and needs, and work to meet them. I was a cool, calm, rational and logical thinker. I could see the big picture and also drill into the detail. I was an assertive and achievement focused professional. I knew the value of hard work and perseverance. I thought that these two together were enough to succeed as a project manager. And, they are… for some projects. But as the stakes for individuals grow, and the political dimension gets more important, they no longer suffice. In fact, I would now argue, they can be a blocker to real success. What you need is willingness and dexterity in communicating with a wide range of stakeholders. Your job is not to be political in your approach, but, you absolutely must engage with the game of project politics. Stakeholder engagement is all about communication. But my discomfort grew when I realized that so is project delivery. Because the uncomfortable truth here is that you get the team that you deserve. This isn’t to say that, if you’re a good person, the universe will reward you with a good team. And if you are bad, then the universe will punish you. If only that were true! Here’s what it means: the investment you put into developing and nurturing your team will dictate the quality of teamwork and individual commitment you will get out. So, how do you invest in your team? You guessed it—communication. I only recently concluded, somewhat reluctantly, that project management is 80 percent communication. Something I have noticed in myself and in almost every project manager I have known, is this: what project managers crave, above all else, is control. We are not control freaks. But our job is simple. It’s to bring control to uncertain, complex, shifting and sometimes confusing environments. And we have designed many of our methods and tools to help us do just that. Plan our work to accommodate risks and contingencies. But in the even less-certain new world of large-scale software development, that was looking increasingly difficult. So agile methods were born, to place new frameworks around lower-certainty endeavors. And in domains that demand the certainty of planning and estimating, yet also need complex software that poorly lends itself to that approach, project managers have designed hybrid approaches that take the most relevant aspects of each approach. What I take from this is that we cannot control the outcomes. But we can control our preparation and readiness for the unexpected. I’ve paraphrased the classic quote that’s often attributed to Abraham Lincoln. It reflects my experience. In any complex project, you’ll have many stakeholders. And each will have different wants and needs from their colleagues. You’ll have different agendas, power bases and styles to deal with. This is why I always think that project scoping is the hardest part of project management. This is where you need to reconcile all the different points of view. But, the uncomfortable truth is that you can rarely do so completely. No matter how hard you work, and how ingeniously you negotiate, there will often be some stakeholders whom you leave unsatisfied. This takes us back to the point I made with my first uncomfortable truth. Project managers cannot avoid politics. Scoping is only partly about negotiating the best mix of functionality, specification and quality. It is largely about finding the right political compromise. This is one that respects the relative power of competing stakeholders. There was a time when I went from being seen as a competent project manager to being regarded as a good one. And, at that point, my firm would sometimes ask me to visit other projects. I went to give advice and support less-experienced project managers. For some reason, those were the days when things went wrong, back on my own project. The more frequently you monitor what’s happening on your project, the sooner you pick up problems. The sooner you pick them up, the smaller they are. Consequently, they are easier to resolve. And, because you are monitoring often, you can check on the effect of intervention and tweak it quickly, if you need to. But, if you fail to monitor often enough, the first you’ll sometimes learn of a problem is when it’s already a big one. So, you’ll need a sizeable intervention to fix it. But then, if it’s a while before you can check-up on it, any residual issues can quickly blow-up, out of control. A project manager needs to be present, to monitor and control your project. If you are not, you aren’t managing your project. Is it any wonder that your plan is out of date on day two? As someone who likes predictability, that’s an uncomfortable truth. But I found that I am also someone who relishes the challenge of constant problem solving. There’s a sense of achievement when you do something. And there’s even more, when you do something against the odds. The reality for me, is that sometimes, a little bit of scary last-minutes-man-ship is exciting. And that’s what I think a lot of us love about projects. 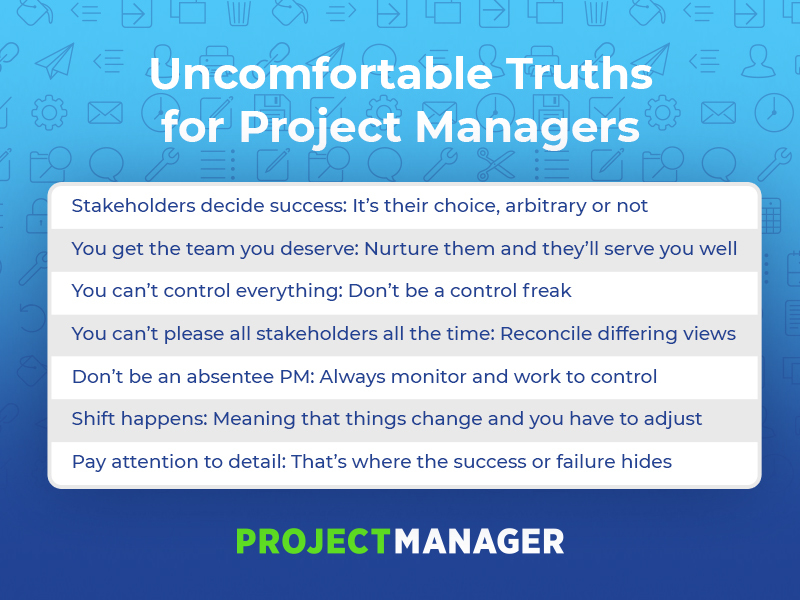 Project managers are mostly can-do people. For us, JDI (short for “Just Do It,” the Nike tagline) is one adjective short of our favorite mantra (JFDI). So, when it comes down to the last stage of a project, or sorting through the final details we’d rather be off, starting something new and more exciting. So, the uncomfortable truth here is that we can’t just ignore the process of project closure. Or, more accurately, we mustn’t. And it hurts. Because your team will want to be off. Indeed, part of your role will be to manage their exits from your project, and into new placements. You will be no less impatient than them. But the devil is in the details, to use a cliché. If you abandon your project before it is finished, or ignore the details because they bore you, there’s a price to pay. And it will be a big one. You’ll have put in 80 percent of the effort. But your project could be only 20 percent of the success it should have been. Attention to detail is crucial. Without it, you could turn a successful project into a sad failure. Truths don’t get more uncomfortable than that. One final uncomfortable truth: you can’t do it alone. Yes, you need a great team, but don’t forget to give them the tools they need to succeed. ProjectManager.com is a cloud-based project management software with a real-time dashboard, online Gantt chart and collaborative features to serve you and your team. See how by taking this free 30-day trial.